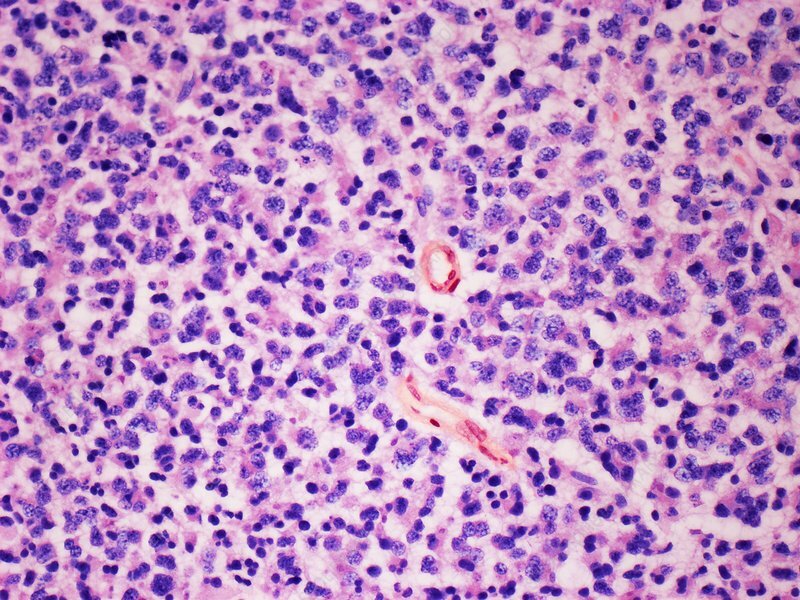 Oligodendroglioma of the frontal lobe of the brain, light micrograph. Anaplastic oligodendroglioma is a type of glioma (tumor of the support cells of the brain) that develops from cells called oligodendrocytes. These cells produce the fatty covering of nerve cells. This type of tumour is normally found in the cerebrum, particularly in the frontal or temporal lobes. Anaplastic tumours are the fastest growing of the gliomas. They occur primarily in adults (9.4% of all primary brain and central nervous system tumors) but are also found in children (4% of all primary brain tumors). Where possible, surgery is the main treatment for an oligodendroglioma. Magnification: x 250 when printed at 10 centimetres across. Human tissue.